ECU Joondalup moved to fourth place on the PS4 National Premier Leagues WA table with a convincing 5-2 win against Subiaco at the ECU Football Stadium. 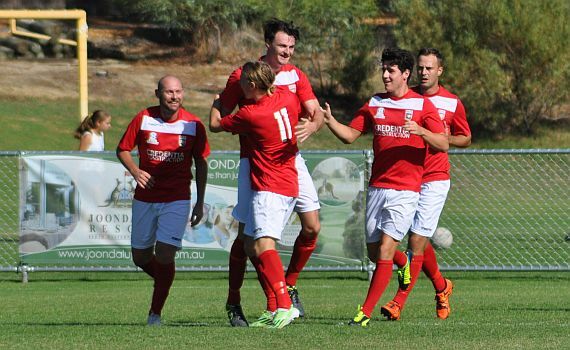 The home side bouncing back from their shock Westfield FFA Cup defeat against Dianella last week, and they shared the goals around with five individual scorers. Shane Pickering opened the scoring early, before Gordon Smith doubled their lead before the break. Bayley Brown-Montgomery added another one early in the second half before Kevin White pulled one back for the visitors. Further goals to Steven McGarry and Harley Orr wrapped up the win, while White bagged a second goal for Subiaco to round off the scoring. Subiaco started brightly and striker Ian McMurray tested ECU keeper David Keenan, before Carlin Feely’s goal-bound shot was blocked by Andy Higgins. But after the early onslaught the home side settled and hit the front on 19 minutes, Pickering firing home Higgins’ corner. Keenan then pushed Carlin Feely’s free kick around the post moments later as Subiaco looked to hit back but on 40 minutes the home side doubled their advantage. Higgins’ corner again causing problems and Scottish striker Smith headed home at the back post. ECU made it 3-0 early in the second half, Amphlett’s sent Smith racing down the right, and his low-cross was turned home by Brown-Montgomery at the back post. Subiaco pulled one back three minutes later describe goal!!!!! ECU continued to dominate and it wasn’t a surprise when they added a fourth just after the hour, McGarry finishing with aplomb after a great through-ball from Smith. It was 5-1 on 77 minutes, Orr turning home Amphlett’s cross. White scored a late consolation goal for Subiaco with two minutes remaining, finishing James Dorling’s, but it was too little too late. Andy Higgins won the Man of the Match, his performance, in only his second game in eight months was outstanding.